The warm days of summer are finally here, and if you’re like most Fort Collins residents, then you’re probably preparing for the Fourth of July, get-togethers with friends and family, and other festive events taking place this summer. At Advanced Landscaping & Sprinklers Inc., we know that the summer can pass by in the blink of an eye, leaving you with little time to care for your home’s landscape. In today’s post, we’ll provide you with three tips for summer landscaping that will help you increase your home’s beauty without taking up your free time. 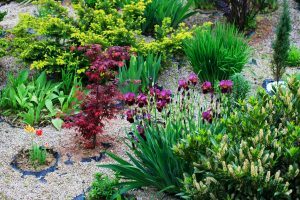 When you’ve finished reading this post, be sure to contact one of our friendly landscapers for landscaping services in Fort Collins. We offer free quotes, so take this opportunity to make the most of your home this summer! Colorado weather is dynamic and unpredictable, especially in the summer. You’ve surely noticed that the weather will often shift from bright and sunny to dark and stormy in a matter of minutes, and if you’re not careful, your garden could be easily ruined by an afternoon storm. Unless you’ve installed an irrigation system, you probably take some time throughout the day to water your plants. Perhaps you go out every morning as the sun comes up, or maybe you spend some time after dinner giving your vegetation a good soak. Whenever you happen to water your plants, check the area carefully to ensure that rain, hail, and the heat of the sun haven’t damaged your garden. You’ve probably heard the myth that watering in the afternoon magnifies the rays of the sun and will kill your plants and grass. This claim is false, but that doesn’t mean that you should water during the hottest hours of the day. The heat of the sun will quickly evaporate the water you use, rendering your water and time useless. Water in the early morning or in the evenings to ensure that you make the most of every drop. If you don’t have the time to water your lawn, but you don’t want to invest in landscaping services, then why not call our landscapers for an irrigation system installation that can do all of the work for you? If you have a habit of mowing your grass short or too close to the roots, then you may be disappointed with the results in a matter of weeks. Short-cut grass is more susceptible to droughts, and the heat of the sun can easily damage the roots of the grass. Moreover, weeds are more easily able to plant their seeds in the soil, making it even harder to maintain a beautiful landscape. Opt for cutting your grass more often instead of giving your lawn a close shave — you’ll notice a substantial difference! 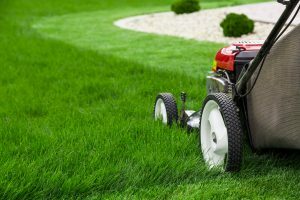 If you don’t have the free time to give your lawn the dedication it deserves, then get in touch with our Fort Collins landscapers to inquire about our lawn mowing and landscaping services. Are you ready to take the first steps toward the landscape of your dreams? Call Advanced Landscaping & Sprinklers Inc. today!